The Douglas DC3 Dakota has, since Arnhem, been the emblem of Air Despatch. Air Despatch units have proudly worn the Dakota Shoulder Flash as a sign of their work wherever they have been in the world. Not for Despatchers was the Div Sign worn by others. To stand as a memorial to Despatchers who have lost their lives in the service of their country, a Dakota aircraft was purchased by the Air Despatch Association, with shares in it being being sold to members. This particular aircraft did not fly at Arnhem, but serviced during Operation ‘Dynamo’ (The Berlin Airlift). An operation in which Air Despatch was involved. The Dakota stands in a place of honour outside 47 AD Sqn RLC at RAF Station Brize Norton. The Dakota was moved to Brize Norton when 47 Sqn relocated from RAF Lyneham which was closed down. 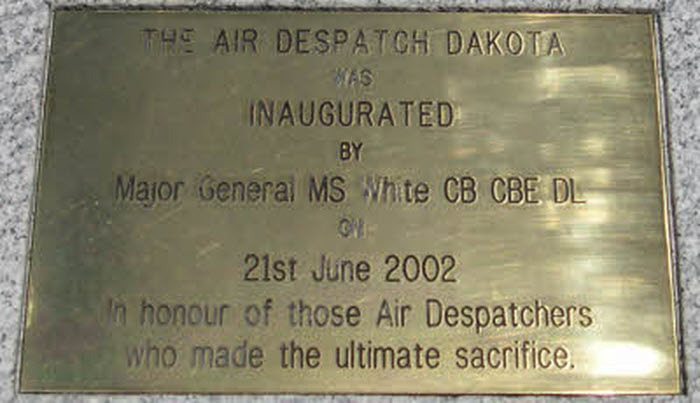 The inauguration of the Dakota Memorial took place on 21st June 2002, and the ceremony was performed by Major General M.S. White, CB, CBE, DL.